So we would all love to be able to get our children’s teachers a gift at the end of the year, but lets face it when you have more than one child or more than one teacher it gets expensive. And if your like me you want your gift to mean something not just a flower or another keepsake to collect dust on a shelf. I found the cutest idea for a gift for my daughters teacher this year and cost me right at $10!!!!!!! Everything came from the dollar store except for the towel!!!! How great is that!! I Found the image and colored that in real quick after I printed it out and then had Bailey make a card with it. Everything but the Towel and soak was from the dollar store. I found the towel at Walmart and I had everything to make the soak on hand. It was a hit, her teacher loved it!!! I was also a parent volunteer in the classroom and spent a lot of time with the kiddos doing reading and math centers so I made a little something for the kiddos. Quick easy and they loved it and so did the teachers! Stay at home mom, Stepmom and Girl Scout Leader with a passion for a healthy lifestyle. What a good idea! Going to the dollar store means you can buy more and Philip a nice basket for your teacher. I wish I would’ve thought of this. I adore this idea. I think it’s so important to let the teachers in our children’s lives know how much we appreciate the work they do. I agree. Especially considering how much they do behind the scenes and how much they spend ou of pocket on our kids! What a great idea! I love the bookworms, so cute! I know! “Bookworms” are my favorite part of this. Every teacher needs a sweet treat. I love this idea! Especially when school starts up. I love your choices of items, too. And the darling labels! I’m always looking for quick, easy gestures to thank the kids’ teachers. This is such a creative gift. I’m sure any teacher would love this! What a great idea for a teach gift. I always loved personalized items like this when I was a teacher. It’s very thoughtful. I know I’d appreciate a gift like this if I were a teacher! It’s a nice combo of treats and useful stuff! This is such an adorable gift! It would be great do to something like this mid year too, teachers need to be reminded of how awesome they are! This is such a cute idea. I am always looking for cute ideas for teacher gifts. I try to do something economical as well for my kid’s teachers – plural. They have never had just “one” teacher and always 6 each – so I love the dollar store option for us. What a super easy way to show appreciation to a teacher! I bet this will give many of those back to school kids an idea on how to show their teacher that they appreciate them. Super cute! This year we took my kids out early so yesterday my husband took our youngest in school back to give our all time fave teacher, his for the year a card and a gift card for some coffee! She loved it. Hopefully next year we have some good teachers to gift! That is the best idea ever. I am so making one of these for sons band teacher to start her marching season off right. I love this idea! My mom is a teacher so I know firsthand all the hard work and dedication that goes into the job. It’s so nice to show appreciation for teachers. OMG – I LOVE your theme and that you made such an awesome gift using items from the dollar store. We all need great ideas like this to help save money, yet still show teachers how much we appreciate everything they do. The dollar store has some nice stuff for very cheap prices, I think. I don’t know a teacher who would not appreciate these! This is a great idea. I love that everything in the basket is useful! I think it’s nice to show teacher’s appreciation, and give them a gift they can use. 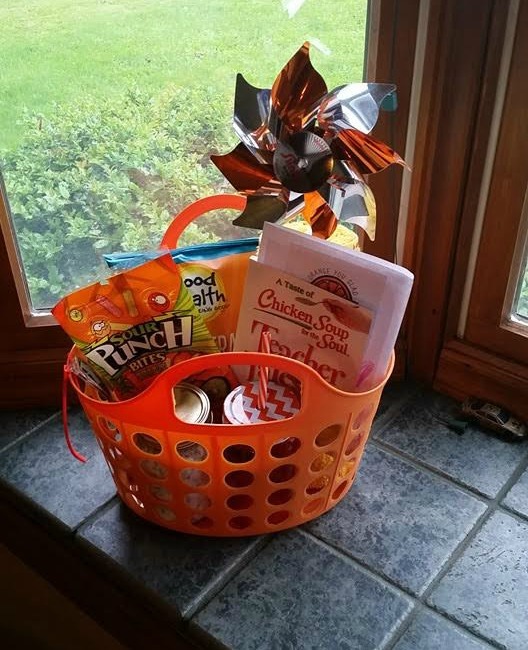 I really like the idea of a gift basket, which you can tailor to each teacher. I think this is a great idea. I love giving out gift baskets. Everyone always seems to love them too. I should do this for my girls teachers next year! Cute idea for teacher gifts! Love that everything was color coordinated, and those book worms 🙂 so fun! What a sweet way to say “thanks” to a hardworking teacher. I think this is a great idea. Teacher gifts can certainly get expensive, especially if you have a middle schooler with six or seven teachers. I love this low cost yet cute basket idea! I’m sure teachers appreciate the gesture and if the gift is actually useful it’s an additional bonus! I love how you picked a fun theme! This is a super cute teacher appreciation gift 🙂 What a great idea for kids to make this for their teacher. Great idea I eel like year we have more and more gifts to buy at the end of the year from teachers to bus drivers to coaches. This makes it doable! What an awesome idea for teachers. We try to do a little something every year for whichever teacher our kids have. I never thought to go to the dollar store to get items for teachers but that’s a great idea. I love the “orange” theme too! Such a cute gift. I can’t believe you found that book at the dollar store, that is quite the score! I enjoy putting baskets together. I get a lot of the stuff at the dollar store. That’s such a thoughtful idea. My girls are in middle and high school and have 7 or 8 teachers each so we no longer do gifts for them. But I do remember the teachers really appreciated the gifts when we did! What a cute way to phrase the gift card, using orange for aren’t. I am sure the teachers were delighted to receive the baskets. This is such a great idea and what a good price point for it. It’s so great that you were able to be able to buy such a variety of items because it was affordable. I’m sure the teacher will really enjoy it. What a cute little gift idea for teachers! We are about to have a dollar store right across the street. I’m sure I will be frequenting it a lot more. The orange pun at the top was so funny, I laughed out loud! These kinds of gifts are great, it’s so meaningful to let you teachers know that you appreciate them. How nice is this! 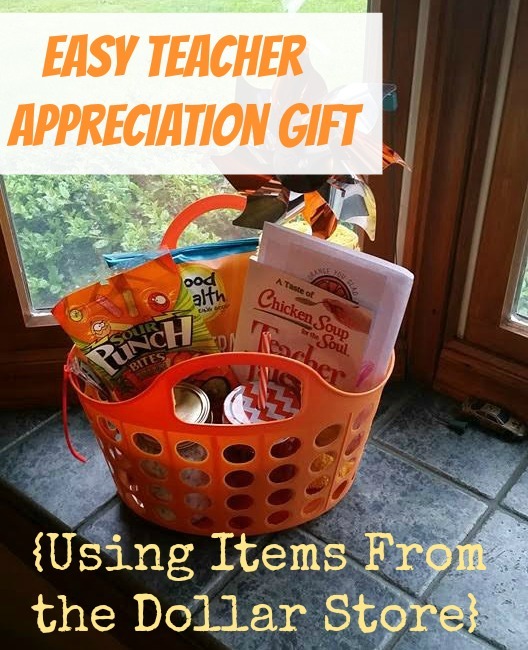 I’m sure a lot of teachers would love to receive a gift basket like this and the best part is that it’s so easy to set up and the kids can help as well. Such a great, uncommon gift idea for teachers! I love the idea of end of year gifts, especially when they’re inexpensive and so thoughtful like this one! What a sweet way to honor her teacher. I love the theme you chose. I’m shocked at how much great orange stuff you were able to find. It’s very touching that one student appreciates her teacher more. I am sure that the teacher was touched by that student. I always make sure we have goodies to give to teachers for days like this! It’s so nice to put together a gift pack for them and see their lovely smiles! Teachers deserve all the recognition. How sweet and touching unexpected gift idea. How I love the creativity of this idea! Teachers would be touch to this kind of gift idea. That is very cute and a brilliant idea to use a theme and items from the dollar store. The book worm are such a cool thought. I don’t have children but I remember that in school we usually would raise money for the end of the year and then one parent would buy something for the teacher with it. Great idea, teachers do deserve some real appreciation from time to time. I lived in a place where teachers are doing extra tiring obligations with no extra pay and sad to say that most of them went to different careers. School starts again for us in August, and Im going to save this for the new school year. Teachers need appreciation! What a great gift for teachers. Everything in there is thoughtful and something they will love! Love the picture of the teacher receiving it! Love this idea! It’s so great for end of the year teacher gifts – I bet all teachers will love this one! Dollar store items too, how great! I have been looking for a gift for my Son’s teacher. This is a great gift idea. It is nice to give something different. That is one classy-looking basket; it does not look at all like it came from the Dollar Store. Your pictures show a great presentation. So cute! Im always looking for cute but simple ways to show my sons teachers some appreciation for all they do. Pretty nice and cute idea. Love it. Thanks for sharing this. I had no idea that the dollar store had such great items! I need to make my kids some teacher gift baskets for the start of school. What a sweet gift idea for teachers! I think any teacher would love this gift set. These are such totally cute ideas! I always just make a cute card and give them a gift card to Target. You just reminded me its end of the semester so off to town to buy soe nice gifts for the teachers . Thanks for this idea! That is a cute gift idea. Love that it’s so reasonably priced too! Such a cute idea! I went really super lame this year and just bought a giftcard. I just had too much on my plate right then! Love, love, love the bookworms! How cute is this idea! We have some VBS teachers that this would be perfect for. This is such a cute gift idea!!! I love it! Those are great teacher appreciation gifts!! Great job!! Awww… what a cute and thoughtful idea!! I love putting little gift baskets together like this for people! That is a cute gift basket. I love how you found things that matched the orange theme. Such a nice idea. I will keep this in mind when my son gets ready for school, maybe next year he will be going to a formal school. That turned out to be really cute! You don’t have to spend a lot to make a cute gift! OK, the bookworms idea was super cute! I love to show my kid’s teachers our appreciation. I should take note of this and make one for my son’s teachers. He’s in 5th grade now and I know that their guidance is a big help. I absolutely love the thoughfulness behind this! I remember putting packages together for my daughter’s teachers. Such a simple gesture but still it helps to show how much we appreciate them. Thanks for the ideas! What a cute idea! I hope she loved it. It looks really easy to put together. Ideas like this are the awesomest. It can make life easy and fun at the same time. Everything is orange and it looks pretty! Thanks for sharing!